Buy Lies Within a Coffee. ko-fi.com/lieswithin - Ko-fi ❤️ Where creators get paid by fans, with a 'Buy Me a Coffee' button. 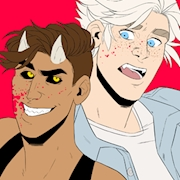 Hey, my name's Lacey and I'm a Toronto-based cartoonist who is currently making a webcomic called Lies Within. If you like what I'm doing and want to support me with funds for much-needed caffeine, I'd very much appreciate it! Secured Payments. Support goes to Lies Within's account. Upgrade Lies Within to a yearly Gold Membership with a one-time payment.